LEWES, Del. 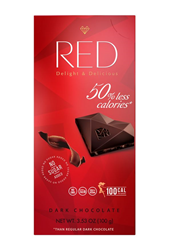 U.S. — Chocolette Distribution LLC, the U.S. sales and marketing division of the Swiss-owned Chocolette Confectionary LLC, announced today the launch of its new “guilt free” RED Delight chocolate collection in the USA this month. The great tasting gourmet RED Delight was developed using patented technology and is one of the world’s lowest calorie chocolates. RED Delight has only 16 calories per piece, which is 50% less than competing brands, or the caloric equivalent to an apple slice. In addition, RED Delight has less fat and no added sugar. The RED Delight Chocolate collection was created by leading chocolatiers from France and Switzerland. To achieve the delicious taste, RED Delight is created using a natural prebiotic inulin, natural, zero-calorie sweetener erythritol and stevia obtained only from natural products. Only the highest quality natural ingredients are used without any cocoa oil substitutes, artificial colorants or preservatives. All products in the RED Delight collection are certified Kosher, non-GMO, gluten free, vegan where noted and have no added sugar. The unique diamond shape of RED Delight Chocolate allows receptors to sense the perfectly opened taste of chocolate. RED Delight is currently sold in the UK, Scandinavia, Central Europe and is launching soon in Germany. Varieties of the 3.5 oz bars of the RED Delight collection entering the U.S. marketplace in December include Extra Dark, Dark, and Dark Chocolate with Orange and Almond, Milk Chocolate with Hazelnut & Macadamia as well as several varieties of Milk Chocolate Nut filled praline boxes. RED Delight will be available nationwide in the USA through all channels via key distribution partners. The product will be competitively priced.